It’s a new year, with our new logo, and a new opportunity to purchase your 2018 CEF shirt! Once again, Mr. Hunt has designated the 1st and 3rd Tuesday of each month as jeans day for CISD educators and staff wearing their 2018 CEF t-shirt. 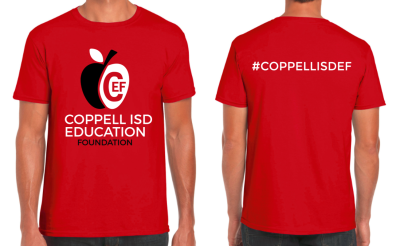 CEF will also continue our monthly raffle for free Sonic drinks delivered to the winning tweeted photo of CISD folks in their shirts. What’s more, with your purchase you are supporting our annual “Give for Grants” fundraising campaign that provides CISD educators funding for innovative classroom programs! Shirts are $20 each and can be purchased online by clicking HERE . Orders placed by July 26 can be picked up at Convocation on Aug 10th. In-person ordering with check, cash or credit card will also be available on that day. The final order deadline is August 17th.